After posting the first blemish of his professional career at UFC 116, former interim heavyweight champ Shane Carwin has just revealed why his body “seized up” after his vicious 1stRound onslaught that nearly ended Brock Lesnar’s evening. Carwin was immediately taken to the hospital following the 2ndRound submission loss and was not available for comment during the post-fight press conference. However, he addressed his loyal following on his official website the morning after Lesnar unified the 265-pound title. Although you could sense the disappointment with every dying word in his blog, Carwin remained classy and appreciative in defeat. However, he has nearly 36,000 followers on Twitter and they were still pressing him for answers. Yesterday, the engineer jokingly alerted fans he may have a more serious problem on his hands than just body cramps. “35 may be the new 90… My Dr thinks I have Bronchitis (life long non smoker). Look for the Carwin Mobility Chair in stores soon!” Carwin Tweeted. To clear the air, the All-American collegiate wrestler (no need to state which Division) elaborated on his current state of health. According to Carwin, his imposing frame froze up because he wasn’t receiving enough oxygen while heaving haymakers in the opening round. “What happened to me July 3rd is called “Lactic Acidosis“. 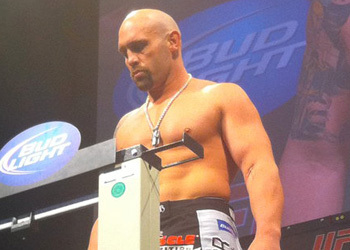 It was brought on by a few things and mainly not breathing while exerting energy,” Carwin Tweeted. “I was all cramped up, nausea and major head ache. Although Carwin’s not making any excuses by reiterating that Brock Lesnar is THE MAN, the 35-year-old stated he was down for a mulligan – STAT. “I will fight him any time I get the chance,” Carwin wrote.